When the hot weather rolls in, I love to make light, refreshing meals that don’t take a lot of time. 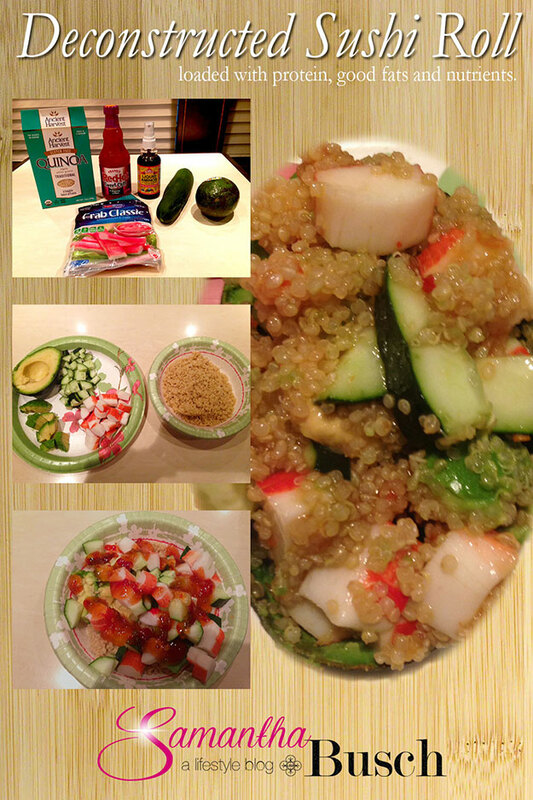 This recipe I created is my version of a deconstructed sushi roll. It is loaded with protein, good fats and nutrients and, even better, it’s super easy to make which gives you more time to spend out by the pool! 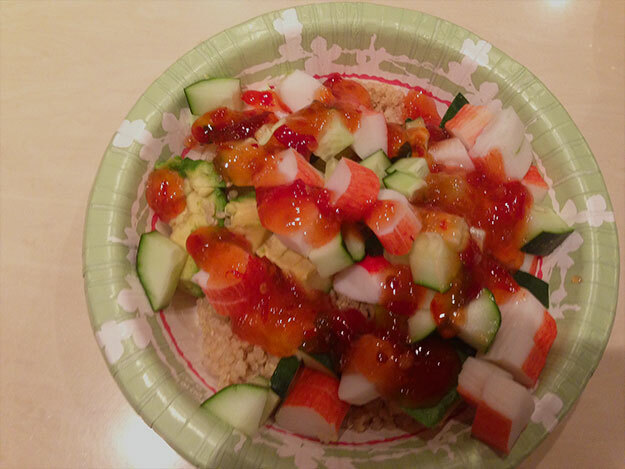 Traditional sushi is made with white rice but quinoa is a much healthier grain since it is packed full of protein, iron, fiber and magnesium (just to name a few of its healthy ingredients) so I opted to use it instead. You will need to make this ahead of time as it will need to cool. Simply follow the instructions on the box (it’s pretty much the same as making rice) and allow it to cool to room temperature or even pop it in the fridge. Take one avocado, slice it open and cube half of it. Be sure not to cut through the skin because, if you want, you can serve it in the shelled out half afterwards. 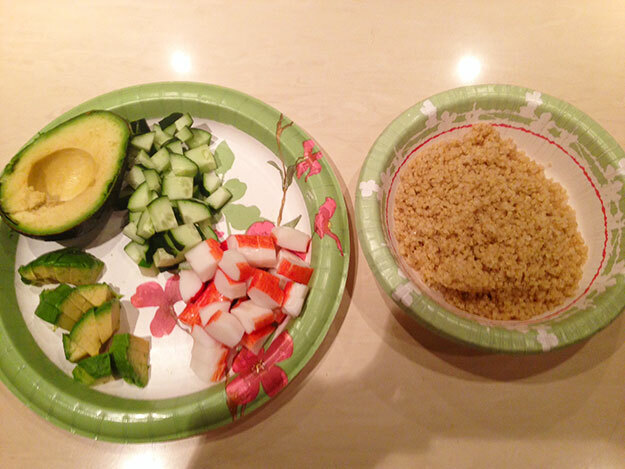 Next, cut up half a cucumber and three crab sticks and cube the same as the avocado. 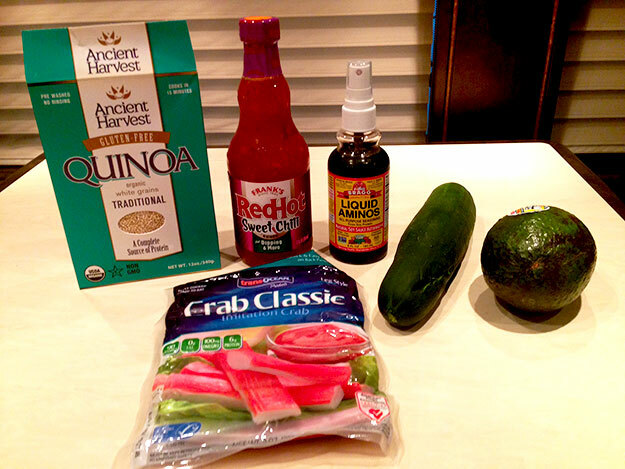 Simply mix all of this with one cup of cooled quinoa. From here, add two tablespoons of sweet chili sauce and a teaspoon (more or less, depending on your preference) of Liquid Aminos or low sodium soy sauce. Next, all you have to do is mix it together and it’s done! 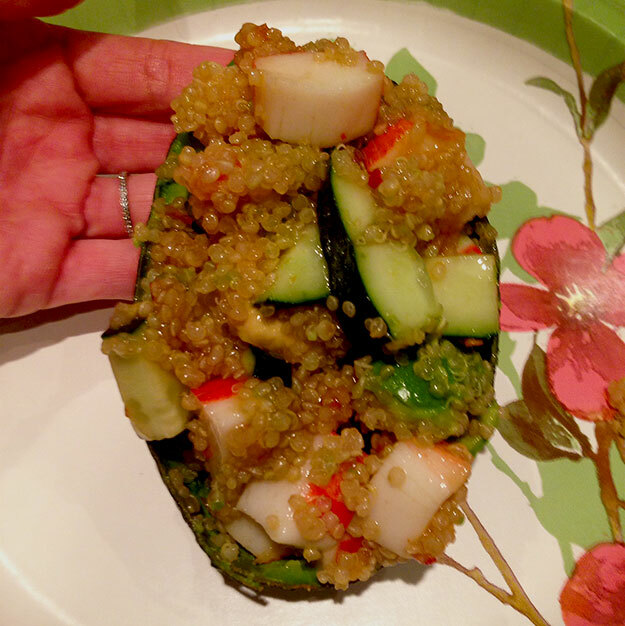 Place into the avocado shell or a bowl and enjoy! Other items that would mix well with this would be edamame and shredded carrots. I would also even try sprinkling some flax seeds on top since they are chock full of fiber, lignans and omega 3 plus they don’t really change the taste so why not sneak them in! **Side Note: What are Liquid Aminos you ask? Well, it tastes just like low sodium soy sauce but, on the label, it is called the natural soy sauce alternative because it is made from NON-GMO soybeans. What this means is that the soybeans used weren’t genetically modified. Liquid Aminos also contain 16 amino acids and these are very important for our overall health. I still have no idea what is better for you, Liquid Aminos or low sodium soy sauce, so if anyone can shed some light on this please leave your response in the comment section. Thank you!